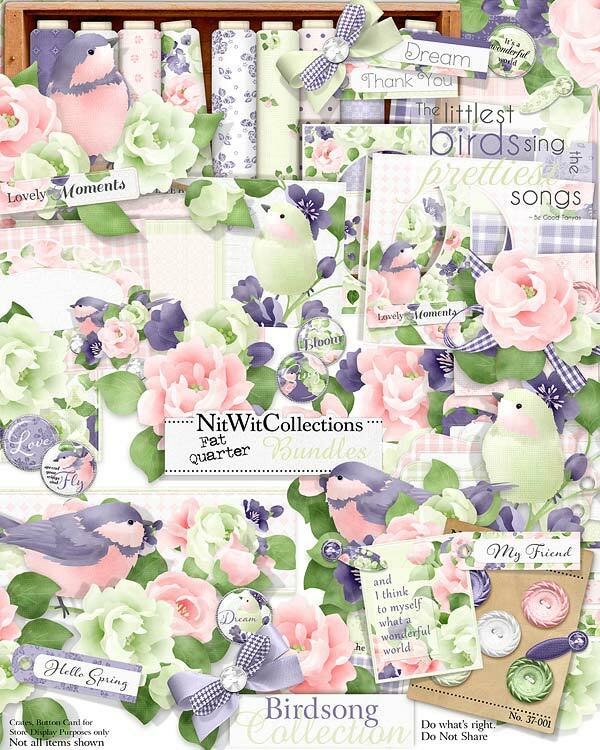 FQB "Birdsong" Collection is a beautiful digital scrapbooking kit and card making kit that brings the feelings of hearing a bird's song, into papers and elements to give you that same song in your heart! The colours, papers and elements will give you such inspiration to create for so many occasions and themes. The sweet birds in branches and flowers, the elegant background papers and of course the rich floral elements all work together to form one MUST HAVE kit. What magical element inspires you??? Are you getting that feeling in your heart yet??? Now click on and download to begin your journey. 2 Floral corners for you to be able to place them wherever you see fit in your cards, scrapbook layouts and mini albums. 1 Flower cluster with 2 of our birds and a sentiment - "Always let your Heart Dream"
4 Photo frames some with simple and some with intricate designs and embellishments. Which one suits your creative vision? 1 Journal card - "And I think to myself...."
4 Labels - blank for you to write in names, dates, titles, etc. 1 Sentiment stamp - "The Littlest Birds..."